Use these helpful tips to get the most from every drop of irrigation applied to your landscaping through the smart use of irrigation systems and supplemental hand watering. Watch your irrigation while the system is running. Check to make sure sprinkler heads aren’t spraying water onto sidewalks, patios or structures. If water is being applied too fast for your soil to absorb it, runoff will occur. Puddling and pooling water may be an indication your water is being applied too fast or too often. Adjust your system to prevent this from happening. Repairs to broken pipes and sprinkler heads should be made immediately, or your system should be turned off until those repairs can be made. Watch how quickly runoff occurs when you’re running your irrigation. This is the maximum run time for your irrigation controller in a particular hydrozone. Divide the total minutes required in the hydrozone into blocks of time no longer than the observed runoff time. Allow a 30-minute rest period in between irrigation cycles. Example: If you need 12 minutes of water in a certain hydrozone, but there is runoff after three minutes, you need to break down the 12 minutes into four separate three-minute long cycles, with 30 minutes between each cycle. Hand watering is especially good when your garden is getting established. You can spend more time watching your plants to be sure they are flourishing in the early stages. When your landscape plants are new, you may need to water more frequently because roots are shallower. Roots on a newly planted one gallon plant are only four to ten inches deep. This is why it’s a smart idea to plant during the rainy season. Before hand watering, look at your plants. Do they appear droopy? Is the soil very dry? If so, give the plants a good drink. Don’t water more than two days in a row. Let soil dry out completely before watering again. Overwatering and underwater symptoms can be similar. Once your plants are established after the first year, your sustainable garden will not need watering more than once or twice a month – if at all. 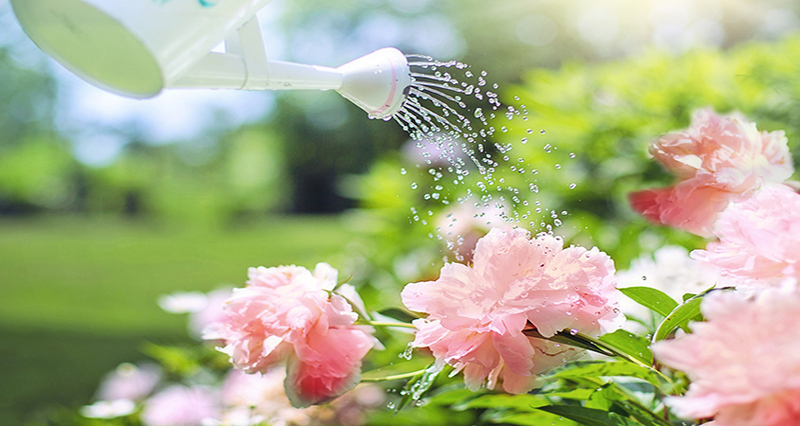 Stop watering after the first seasonal rains begin and let nature take over.